Trouble is their business, and business is good. Sean McGinley (Single-Handed) and Allan Hawco (Love & Savagery) are Malachy and Jake Doyle, a father-and-son detective team that solves intriguing cases while mismanaging their own relationships with girlfriends, ex-wives, a rebellious daughter and a hot cop. Set against the backdrop of St. John's, Newfoundland, this hit Canadian comedic drama is "fast-paced, witty, old-fashioned fun"--Globe and Mail (Canada). 12 episodes, 8¾ hrs, 3 DVDs, SDH. When Jake's childhood pal, Benny, is charged with a vicious murder, the Doyles follow a trail of drugs and secrets in an attempt to clear him. Meanwhile, Jake's divorce proceedings heat up, and a new police detective turns his head. After hiring the Doyles to find a man she claims to be her father, a young woman turns up dead. Suddenly, plenty of people want to find out herreal identity. Malachy's old flame asks him to investigate a suspicious bar fire that killed a waitress. Jake discovers some stunning news about his soon-to-be ex. After 15 years in prison, a man wrongfully convicted of murder challenges the Doyles to find out who really killed his wife. It turns out that the suspect pool features some seriously odd players. A beautiful businesswoman suspects her husband is up to no good. But the Doyles discover that his secret side action is more dangerous than they first suspected. Jake's troubled ex-lover shows up in town, newly married--and worried about her husband's fidelity. As the Doyles dig into her story, they discover a dangerous love triangle that lands Jake in jail. When Jake discovers a beautiful woman stumbling around a cemetery, he agrees to help her regain her memory. But is her amnesia just helping her hide from a shady past? A bitter widow is furious that her husband left everything to a woman she's never heard of. The investigation leads to a missing safe with a shocking secret inside. The shady owner of a local food truck is desperate to locate his missing driver--not to mention, the truck. But Jake's job is made tougher by a Bulgarian drug ring. An irritating crime novelist is tailing Jake for inspiration. As they pursue a simple case of marital infidelity, they stumble on a much bigger crime. A nervous groom disappears before his wedding, and things gets even crazier when the Doyles discover that the victim has kidnapped a priceless racehorse. Jake's ne'er-do-well older brother, Christian, is the target of a murder investigation. 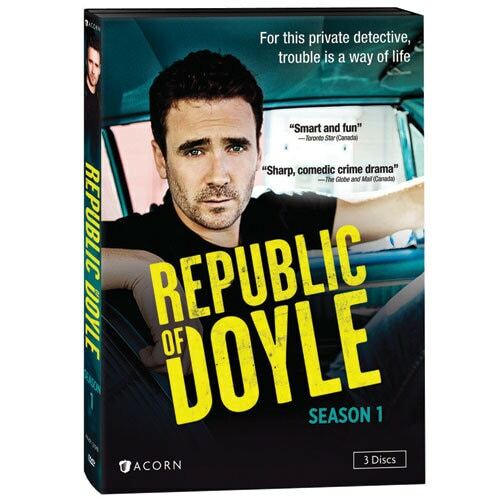 As he races to clear his name, the entire Doyle clan is threatened with some major changes. Rating: NR. Contains coarse language and sexual situations.